We're officially twelve days from Christmas and we're all doing the holiday countdown. Whether that's for time off with family or sweating that we only have eleven and a half shopping days left. 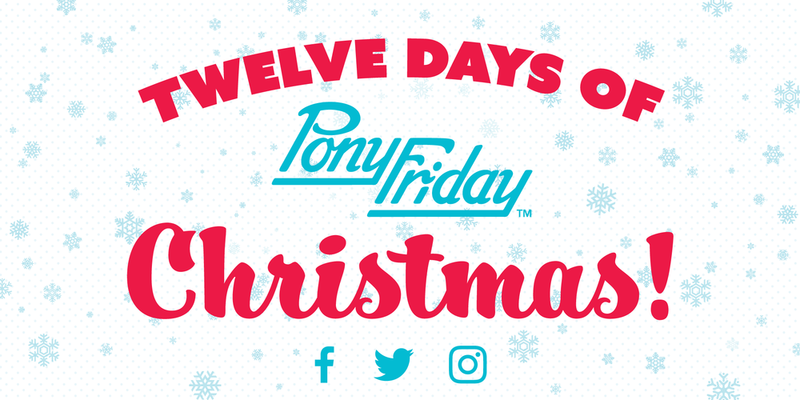 This year we're getting in the spirit full swing with a holiday countdown, Pony Friday style! There's only a dozen days left! If you don't have your shopping done, we'd be happy to help. Visit our shop and tick those last few people off your list. Our socks are perfect stocking stuffers and the water bottles are the perfect way to avoid needing to get sizing right. We love one-size-fits-all! The hats and toques are also solid choices for your present giving needs. Okay, now that you're covered on the gifting front, we like to invite you to follow us on social media. Join us on Instagram, Twitter and Facebook as we celebrate the days leading up to Christmas. Our handle is @ponyfriday on all three social media platforms.